We won tickets to see Twilight. And we're so excited. Because for those of us who have not read the books, each new movie offers an array of befuddling developments, often to our besument. Some people are really into Twlight, and I think that's great. I think that even these fans can admit that the films have a nature that lends any viewer, fan and critic alike, complete entertainment. Whether you're the die-hard crying on the front row or the novice laughing in the back, it's an experience unlike any other. As for me, I'm team quirky vampire brother who's dating his sister and tried to eat Bella in the last movie. Jasper's my favorite too. What'd you think of the film? Definitely the best one thus far. And totally true to the book (in case you were wondering..). I am impressed that you saw the movie already...such a Twihard (teehehehehe). 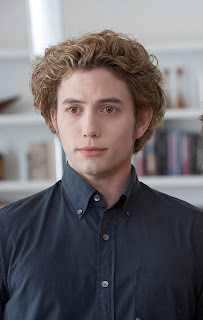 I could do without Jasper, but I simply could not do without his hair. Do you think he'd trade me?